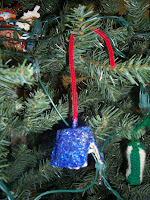 One of the first projects we do this month is to make an ornament for our class Christmas tree. These ornaments are SOOO easy and also SOOO pretty. They brighten up any tree. First cut the cup portion out of the egg cartons so you have as many as you need. Have the children pick our a color pipecleaner that they like. Push the pipecleaner through the cup, so it looks like a bell. Next have the children paint the whole part of the egg carton cup with glue. I put some Elmer's glue in a dish and just let them use a paintbrush. 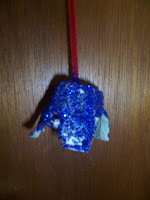 After the cup is covered in glue have the children pick out the glitter they would like. Then sprinkle the cup with glitter. Make sure it all gets covered. After they dry let the children hang them on the tree. They really look great. 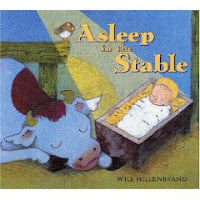 The book I read today was "Asleep in the Stable,: by Will Hillenbrand. It was a very cute story of a baby owl waking in the evening to find a new addition to the stable. He has all kind of questions for Mama Owl about it. He learns of the Heavenly Father's warmth and love for all. That was fun! My kiddo's have made these too, but we added a jingle bell to the inside which made them even more super terrific!Love your blog!